(From the introduction) The Phantom was, and still is, used as a term of measurement in fighter talk. As this was written, some forty-two years after first flying, the Phantom is still receiving upgrades as a front fighter noise, smoke and forward motion by the Phantom. But the day will come when the Phantom will no longer take the skies in military service. Then it will only be seen by the public… as an exotic flying warbird and perhaps on the ground of a museum where it joins other icons of the past. 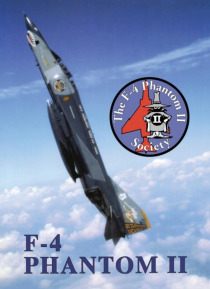 With this book the Phantom Society honors all those who have manufactured, worked, maintained, and flew the F-4. To those fortunate enough to have the Phantom in their past, even if only to see it fly, reminisce; to those in the future who will never see the Phantom fly, you missed the show.